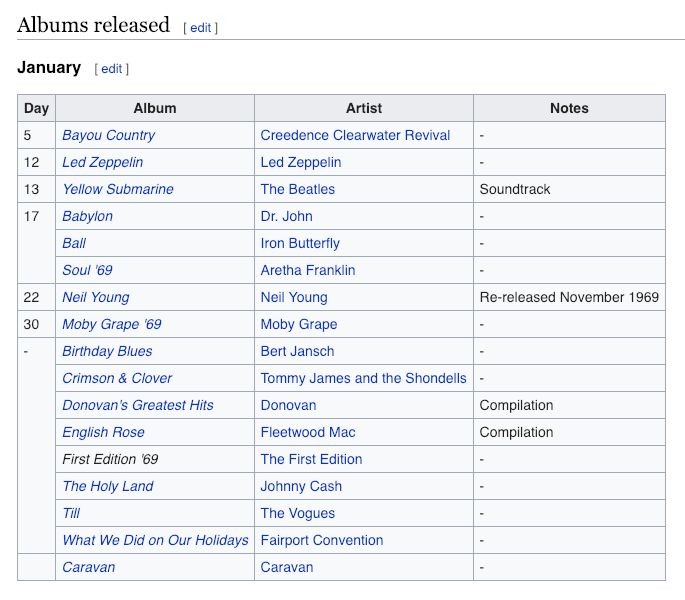 In 2019, I will write a monthly feature of music released 50 years ago from that month in 1969. 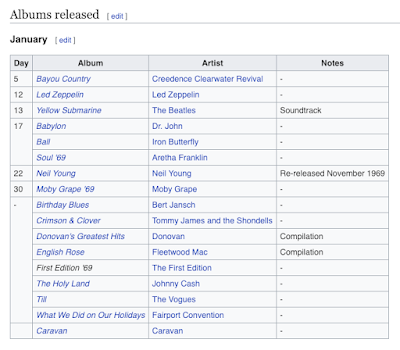 I'm going to use 1969 in music from Wikipedia as my primary source as you can see by the January list here. If I (or Wikipedia) miss a big album, please feel free to write a comment, and I'm sure I will correct that in a re-edit from that blog. I also plan to feature an entire album deemed 'great' (by me of course) from a month in 1969. Abbey Road and Crosby, Stills & Nash are just two albums that come to mind. In January, 1969 I was in Mr. Richard Ziegler's 8th grade homeroom class. During that year, I became President of the Antique Bottle Club and certified nerd. Mr. Ziegler formed the club after his passion for finding and collecting old bottles in the creeks and old dump sites around the central coast of California. I did the same for a couple years and to this day still have boxes of antique bottles that I've carted to every apartment or house that I have ever lived in. Looking back, I remember one Jr. High dance where a local cover band of high school students performed the song, In-A-Gadda-Da-Vida while I watched from the sidelines as kids tried to dance to it. As a side note- the album also titled, In-A-Gadda-Da-Vida released in 1968 was the biggest selling album of 1969. If you follow Monday Monday Music, the real content is listening to the weekly YouTube playlists that I put together. And I thought it was my fantastic writing. No dummy, you just began the last sentence with, "And." Ok, so one of the keys of life is making the time to do the things YOU want to do. If you've followed me this far, listening to music is one of those magical things of life. So strike a match, light the incense and get back to a little 1969 in music. One of the goals this year with my blog is to present whole albums from the past and present. Great albums much like great novels are a musical narrative that must be experienced whole. Songs brought together in an album often write their own little chapters that bring together an emotional and cerebral experience. Collective songs on an album have the power to alter your state of mind, rise you up, take you on a journey, or just make you smile and shake your head to the rhythm. Tommy Emmanuel is one such musician who is revered by many around the world. You can look at his discography and realize that he has made an album almost every 2-3 years since 1979. When you accomplish something like that, you realize he is making these albums for his joy, and the joy that it will bring others. Growing up, Tommy's family formed a band, sold their house and went on the road to perform when he was seven years old. Over the years he played in numerous bands traveling the world. His fame developed over the years as a highly coveted 'session player' recording on many musicians albums, not to mention his fun and relaxed personality made him friends and fans everywhere he went. Tommy's gift as an acoustic guitar player begins with his hero, Chet Atkin's and following Chet's Travis picking style. Tommy as an Australian, is pure Americana in that his passion is to mix- jazz, blues, bluegrass, country, folk, rock and world beat rhythms into a musical deep dive accompanied by his famous finger picking. Tommy often beats his guitar with his right hand while laying down a percussion line with his left thumb on the top bass strings, while the remaining left fingers blend in a melody. When you watch this you realize his right fingers are literally dancing on the strings and he becomes, a one man band. Tommy does around 300 concerts a year all over the world. His heart and soul is the definition of troubadour. This album is a real collective treat that tells a story based on your imagination. 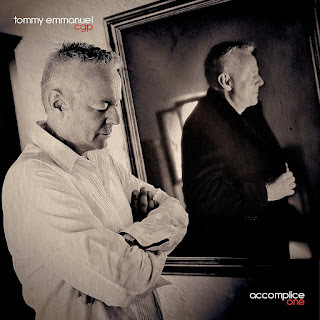 All the songs from Accomplice One are on the playlist this week, and please make time to watch Tommy's TED Talk at the end. Tommy's a classical gas! As a footnote- I see Tommy has just released a new album called Heart Songs with John Knowles on January, 11th. And, in the story of my concert life have just discovered he played in San Diego at the Balboa Theatre on January 12th. I can't believe I missed this opportunity, my verbal language is quite colorful at the moment! One of my new finds on Netflix is Off Camera (Sam Jones Pictures). In the 2014 Series 1: Episode 4 (Netflix Link) is Sam's interview with Val McCallum. 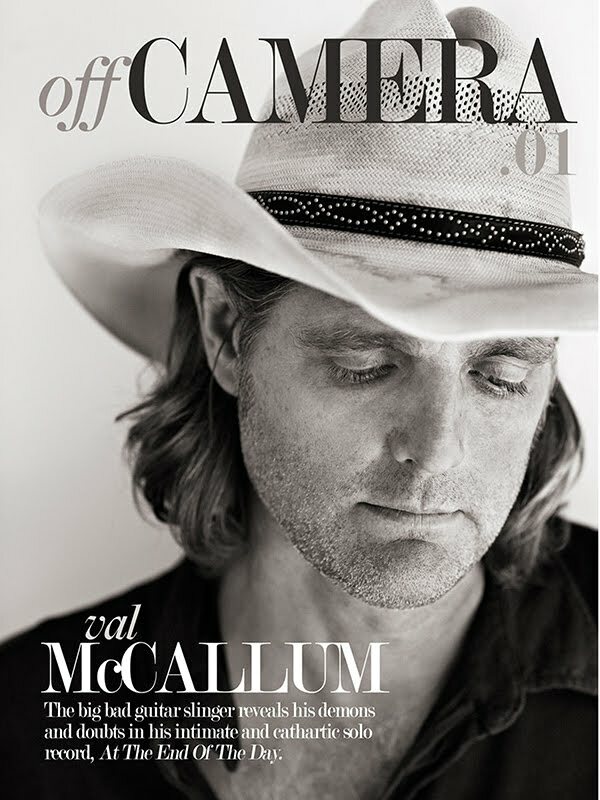 I had never heard of Val before, even though he probably was introduced by Jackson Browne at his Balboa Theatre concert in San Diego a couple years back. Val is Jackson's long-time lead guitar player on tour. Val McCallum is the son of famous parents David McCallum and Jill Ireland. Val was born in 1963 and his father David starred in one of my all-time favorite TV shows from 1964-1968, The Man From U.N.C.L.E. as secret agent, llya Kuryakin. I hesitated to write the above paragraph, as I'm sure Val lives the constant reminder of his famous parents before discussing his music, but for me being a baby boomer, I think he can appreciate the connection. However, it is Val's closeness to his mother Jill in the Off Camera interview and her long journey with breast cancer that sucked me into the world of Val McCallum. I enjoyed his stories of youth, going to school with the Jackson Five, and into the life of becoming a musician and a session with Harry Nilsson as his first professional gig. Sam Jones dives his into his 2012 solo album, at the end of the day which I immediately streamed off Amazon and then began the YouTube playlist for this week. 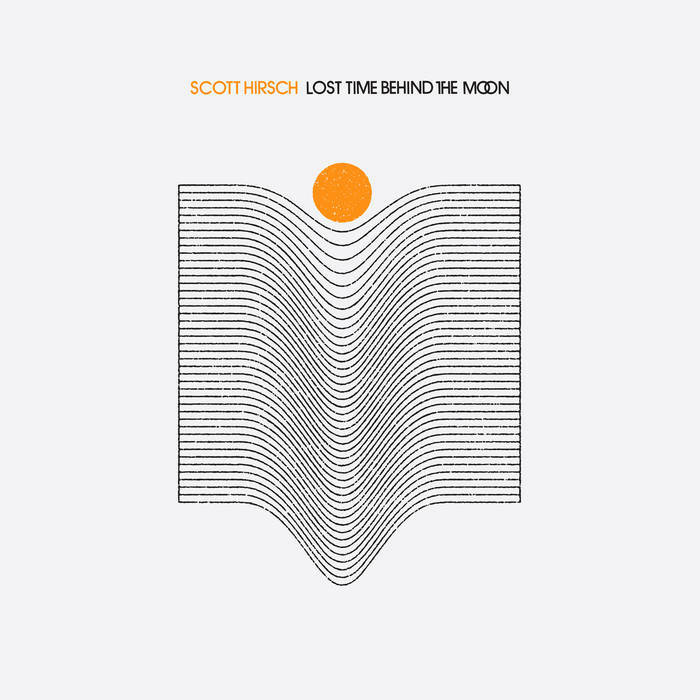 In following last weeks blog about Scott Hirsch and his new album, Lost Time Behind the Moon; both albums are perfect January listening to albums as I'm writing this on a rainy cold Saturday with the fireplace gas logs burning. 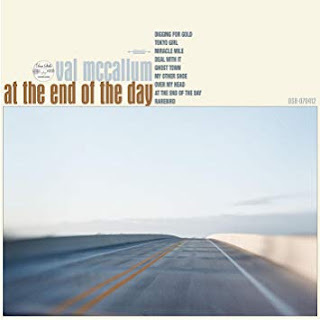 If you're into the Americana genre, at the end of the day is a must listen with Val's well crafted songwriting combined with his sparkling acoustic and electric guitar. 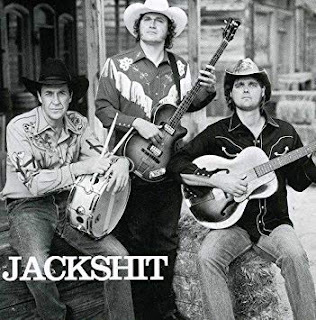 And speaking of Americana, Val is also in what you might call a comic country band called Jackshit. Not only is Val having a blast just having a fun band, he's teamed with Elvis Costello's rhythm section, Pete Thomas on drums and Davey Faragher on bass. This is an extremely talented band in the same tongue-in-cheek vein as Dan Hick and His Hot Licks was, but completely different. So my friends just sit back on this winter's day and enjoy the music of Val McCallum. 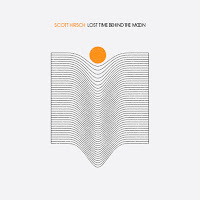 In my last blog, My Favorite Songs of 2018, I included several songs from Lost Time Behind the Moon by Scott Hirsch. 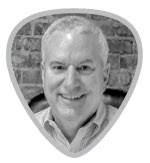 Here's a nice review from Pitchfolk by Stephen M. Deusner that will get you up to speed about Scott. I myself wasn't aware of his music until I stumbled upon Lost Time Behind the Moon on Amazon Music's New Releases section. After reviewing and rejecting many songs for my 2018 list from famous artists who didn't make my cut, Scott Hirsch was a great fresh find! After this past hectic holiday season, you might find yourself just needing to let your mind drift a bit. 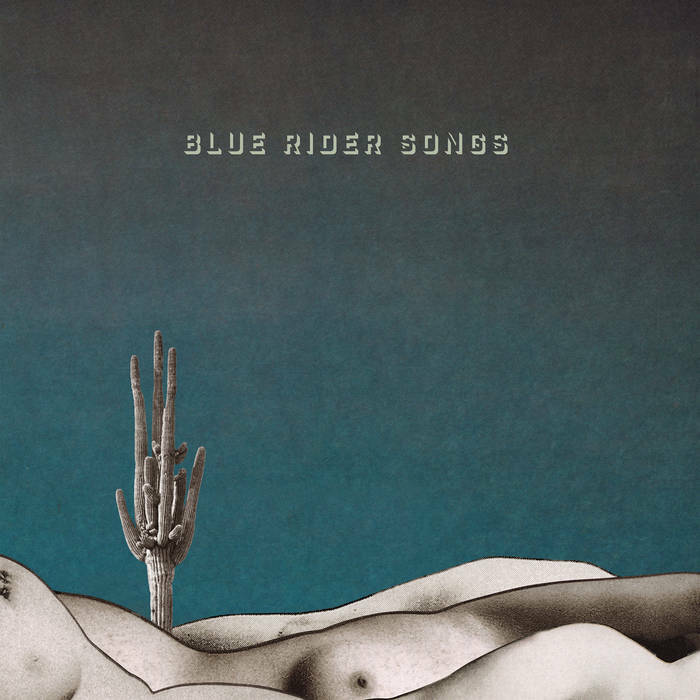 This album is just the ticket to putting you on the 'lost highway' of thought. 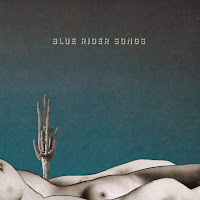 In this weeks playlist on YouTube I have included all the songs from Lost Time Behind the Moon and Hirsch's 2016, album, Blue Rider Songs. I have to mention that Scott Hirsch lives in Ojai, California which always brings me back home to my days growing up (and trips back up to) the central coast. I'm going to venture that this region and state are the inspiration for many of his songs. Most people think of California as just a bunch of freeways when it in fact it has so many back roads and open space to explore. I also see that Scott is a frequent performer at the Ojai Underground Exchange (and just this past Saturday), as I have included a couple of live video songs from there as well. Also, just updated (1/12/19) - Living Liner Notes for Lost Time Behind the Moon.